PennsylvAsia: Dubbed version of Sword Art Online The Movie: Ordinal Scale (劇場版 ソードアート・オンライン -オーディナル・スケール) in Pittsburgh, April 23. 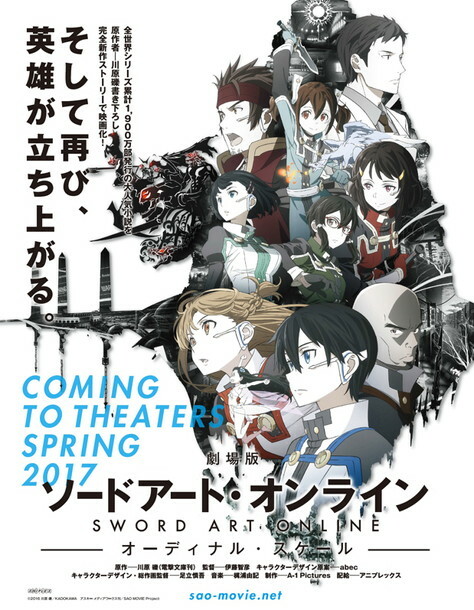 Dubbed version of Sword Art Online The Movie: Ordinal Scale (劇場版 ソードアート・オンライン -オーディナル・スケール) in Pittsburgh, April 23. In 2022, the world of virtual reality was upended by the arrival of a new invention from a genius programmer, Akihiko Kayaba, called NerveGear. It was the first full-dive system, and with it, came endless possibilities to VRMMORPGs. In 2026, a new machine called the Augma is developed to compete against the NerveGear and its successor, the Amusphere. A next-gen wearable device, the Augma doesn't have a full-dive function like its predecessors. Instead, it uses Augmented Reality (AR) to get players into the game. It is safe, user-friendly and lets users play while they are conscious, making it an instant hit on the market. The most popular game on the system is "Ordinal Scale" (aka: OS), an ARMMORPG developed exclusively for the Augma. Tickets for the 2:00 pm show are available online for $15. The theater is located at 1449 Potomac Ave. in Dormont (map), and is accessible by Pittsburgh's subway/LRT at a block south of Potomac Station.